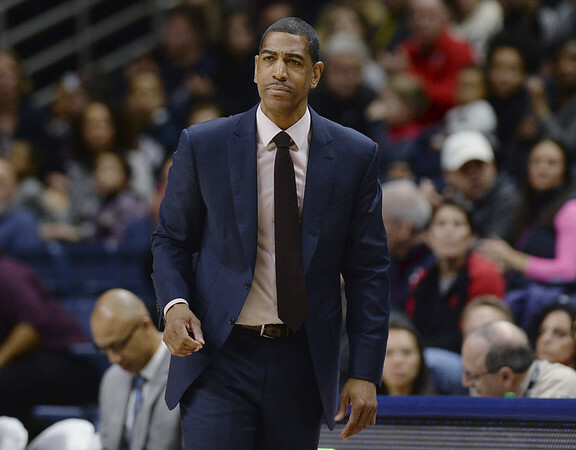 HARTFORD - Former University of Connecticut men's basketball coach Kevin Ollie has lost a bid to stop the school from unilaterally ending arbitration proceedings related to his firing if he files a racial discrimination complaint against UConn. Federal Judge Kari Dooley in Bridgeport on Monday approved a motion by UConn to reject Ollie's request, deciding it was filed prematurely. Dooley did not rule on the merits of the request. Ollie and UConn officials are in arbitration related to his internal grievance over his firing last March. Collective bargaining rules say UConn can end the arbitration if Ollie files a discrimination complaint with either the state Commission on Human Rights and Opportunities or the federal Equal Employment Opportunity Commission. Ollie is concerned that deadlines to file a discrimination complaint will pass before the arbitration is complete, and he asked the judge to allow him to move forward with the complaint during the arbitration. UConn has said it won't waive the collective bargaining rules if Ollie files a complaint. The university fired Ollie in March after a 14-18 season, citing NCAA recruiting violations. The school said that because the firing was “for cause,” it did not have to pay Ollie about $10 million left on his contract. Ollie, who is black, plans to file a racial discrimination complaint against UConn, saying the school treated him differently from former coach Jim Calhoun, who is white and wasn't fired after being penalized for recruiting violations. Ollie's lawyers said that Dooley's ruling will allow Ollie to raise the same issues at a later date and that they are confident Ollie will be able to file his discrimination claims after the arbitration. “We are obviously disappointed by the court's decision,” Ollie lawyer Jacques Parenteau said in a statement. "We believe that the University of Connecticut's efforts to deter Coach Ollie from pursuing and preserving his discrimination claims are sufficient to trigger the jurisdiction of the federal court. We are reviewing the decision for purposes of appeal. “Kevin Ollie understands that fighting for his rights against the University of Connecticut is a difficult undertaking, but make no mistake about it; Kevin Ollie is playing a long game,” the statement said. Messages seeking comment were left with UConn's lawyers. Posted in Newington Town Crier, UConn on Tuesday, 5 February 2019 13:37. Updated: Tuesday, 5 February 2019 20:56.